Flyball is active in a number of countries around the world. The most active flyball countries where competitions are often held include U.S.A., Canada, Britain, Belgium, Australia, Italy, The Netherlands, Germany, Switzerland and Austria. Countries where flyball is still a growing sport include Japan, Korea, Poland and South Africa. The rules of flyball in most countries are based on the rules of North American Flyball Association (NAFA); However, there are some small differences. These differences are mainly with rules that have been recently changed by NAFA but not other associations. Some countries still use the more traditional old arm-style boxes. 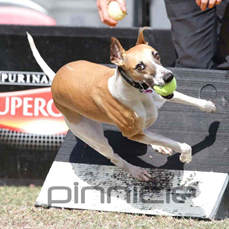 There are a few ways in which the Australian Flyball Association rules differ from NAFA rules. For instance: when a team breaks out, AFA title points are still awarded. Under NAFA rules, dogs don't earn title points when their team breaks out. Flyball is run either inside on mats or outside on grass. Almost all competitions in Australia are outdoors. Surprisingly few competitions have had to be cancelled due to bad weather. In Belgium, dogs don't earn points and titles. Jump heights in Belgium are measured in centimetres rather than in inches, which makes small differences to the heights. In 2000, relaxed quarantine regulations allowed the first U.K. team to travel to the European continent for the European Championships in Belgium.